With Gillum’s defeat of former Rep. Gwen Graham, Democrats will send three black nominees for governor to November’s general elections. A large number of African Americans are running for competitive House seats in majority-white districts. A black Democrat could become the next House speaker, and several of the Democratic Party’s top-tier prospective presidential candidates are black. 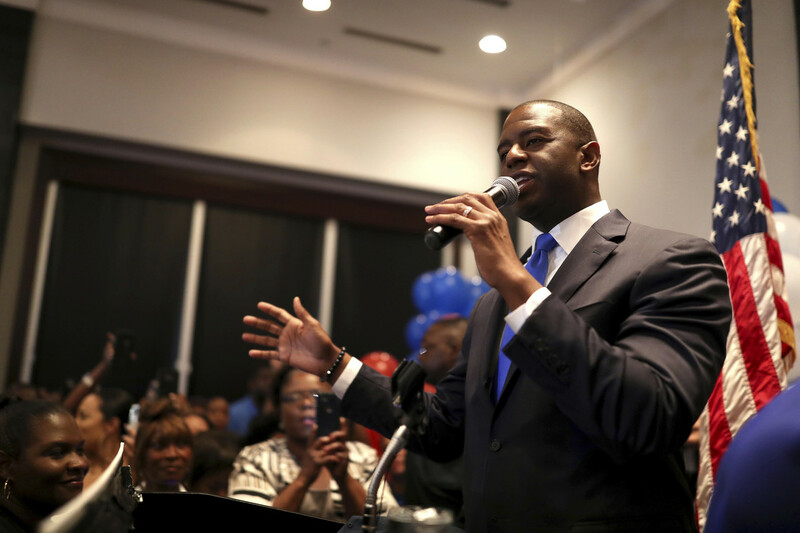 Gillum’s primary victory — like Abrams’ and Jealous’ — reflects the still-evolving prospects of African Americans in the Democratic Party a decade after America elected its first black president. African Americans, while serving as the electoral backbone of the Democratic Party, have long been underrepresented in statewide office, and Gillum’s victory stunned Florida’s political establishment. Gillum, the mayor of Tallahassee, was running in third or fourth place in public opinion polls before an endorsement from Sen. Bernie Sanders (I-Vt.) this month. Despite being outspent on television ads, he maintained that he could win if he won over black voters — who make up about 28 percent of Democratic primary voters in Florida — as well as white progressives. Following his late surge, he will now face a Donald Trump-endorsed Republican, Rep. Ron DeSantis, in the general election. At his victory party Tuesday night, Gillum told supporters that “this thing is not about me.” But if elected, he would become Florida’s first African-American governor, while Abrams is vying to become the first black woman governor in the United States. They and Jealous are all progressive and relatively young, with Jealous the oldest at 45. The Democratic Party’s large field of prospective presidential candidates includes such black politicians as Sens. Kamala Harris (D-Calif.) and Cory Booker (D-N.J.), former Massachusetts Gov. Deval Patrick and former U.S. Attorney General Eric Holder. But the field of African American candidates is deeper than it has been in previous years. In House races, more than half a dozen black Democrats are running in districts whose electorates are mostly white — significant to African-Americans traditionally considered less competitive in such districts. If Democrats retake the House in November — and if Minority Leader Nancy Pelosi (D-Calif.) does not run or is defeated — it is possible the body will elect its first black speaker. Potential candidates include Rep. Jim Clyburn of South Carolina, Hakeem Jeffries of New York; Cedric Richmond of Louisiana, Elijah Cummings of Maryland and Marcia Fudge of Ohio.